LARGE MASTER BEDROOM FOR LEASE 200 UNWINS BRIDGE ROAD, SYDENHAM ******************************************************* CLOSE TO TRAIN STATION FULLY FURNISHED CLEAN MASTER BEDROOM AVAILABLE. LOCKABLE ROOM WITH FLY SCREEN ON WINDOWS. Ceiling fan (perfect for summer). ROOM CONSISTS OF: QUEEN bed/mattress, wardrobe, cabinet, bedside cabinet, table, chair. bed linen can be supplied. share Outdoor undercover entertainment area. Large seated front veranda. SHARE BATHROOMS and LAUNDRY. 24 hour convenience store across the road. Looking for a non smoker, easy going male or couple. All Bills included in rent: elect, gas, water &amp; internet, nothing else to pay. 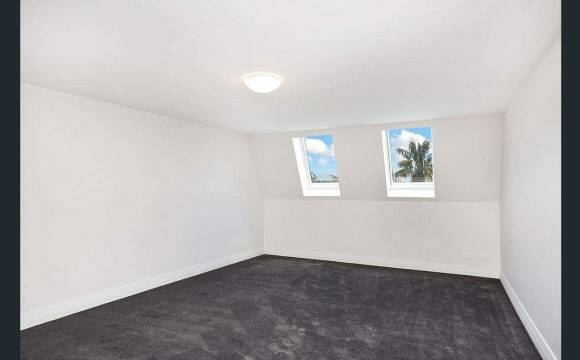 rent: $280 pw sec. deposit: $560.00 $20 extra tariff for two people sharing. This large 4 bdrm house is so lovely to live in and has been recently renovated with a modern flair, drawing plenty of fresh air and natural light. The garden is lush and gorgeous with plenty of space for relaxing outdoors and BBQing. This is a family home with warm, friendly and considerate people. Not suited to people with an overly party oriented lifestyle, though I enjoy a few social drinks. This large room is fully furnished with ducted A/C and has lots of natural light and a huge built in wardrobe. The single beds have quality sealy posturepedic mattresses and are super comfy. The second bed can be made into a day bed/lounge or joined together to make a king bed .Rent includes high speed wifi, electricity, gas and water, i.e. no extra charges. The house has 2 ultra-modern bathrooms, you will share your bathroom with only 1 other flatmate . Easy access to transport, shops, CBD and the airport. Train- 10 minute walk to Sydenham Station access to T2, T3 &amp; T4 lines. Bus- 3 minute walk to route 422 ( to city via Newtown) Walk- 20 minutes to King St Newtown ; 15 mins to Marrickville, 15 minutes to Sydney park. The Inner West is one of the most exciting, vibrant, diverse and interesting neighbourhoods Sydney has to offer. We are a couple of minutes walk to a cafe, craft brewery and urban winery as well as a supermarket. We are easily accessible to the CBD, Newtown, Marrickville, Sydney Harbour and Sydney's beaches. 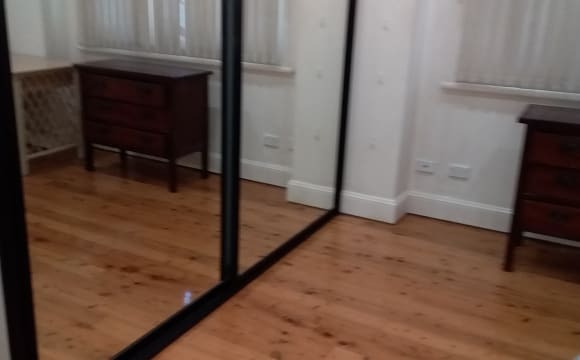 This room would suit 1 professional person, please no couples. We're a clean household who have a great balance of socializing and personal space. We are close to many different public transport options and quite a few hidden gem food shops. 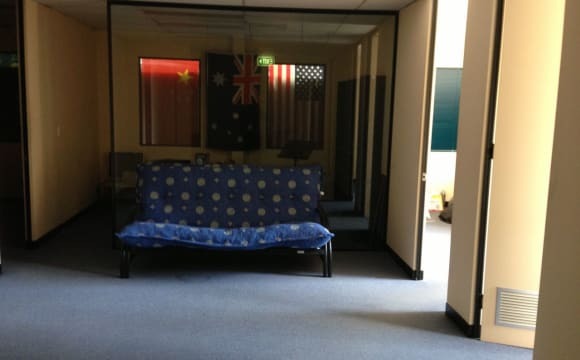 The loungeroom has almsot every video game system made by humankind from SNES to 360 as well as Netflix and Stan but dont worry you wont have to hear that all the time, coupled with air conditioning in every room. Theres more space than we know what to do with so the chances of getting in each others way are small to none. The whole house has double glazed windows so barely any noise gets in or out. Its a pretty quiet house during work nights but we do like to kick back and have drink from time to time. A 12 month old bright and open property that we have luckily been the first tenants to! The room for rent is spacious with a built-in wardrobe and desk, and can come fully furnished or unfurnished. The rent includes unlimited wifi and all bills included. The house has inbuilt air conditioning and is only a 10 minute walk to both Sydenham and St Peters train station. We are hoping for a person who is around the ages of 19-29. Thanks! So we have a spare room available in this gorgeous 3 bedroom terrace house in Tempe. It comes with all basic furniture ( room can be basic furniture or unfurnished) and built ins and a newly renovated bathroom with a bathtub and with a combined living/dining kitchen. It has a cute little entrance with a little grassed area and a veggie patch (Work in progress). I’m quite new to the house so any personal touches are more than welcomed. It is super close (7 minute walk) to Sydenham station and Tempe station is also very close by which is about 18 minutes to central station. You would have your private room with a double bed. Rent would be $250 including bills Minimum stay is 1 month, 2 weeks departure notice preferred and a 2 week bond is required which will be receipted if requested. This beautiful house is very modern, quiet and has got easy access to public transport. Close to city , uni and cafés &amp; restaurants. Internet and all bills included in rent which is $300 for a single person or $370 for a couple. The room available is large (3.5m x 3.6m) and has a gorgeous window (perfect for window sill plants) and will be available 25the April (flexible). We are looking for someone who will need to go on the lease, to be re-signed soon. We also have a garage available for storage/bicycles (or kayaks/ pool tables?) plus plenty of on-street parking. Shared Twin Room Available in Marrickville Price: $175/Week per person Features: -Fully Furnished; -All bills included; -Unlimited Wi-Fi; -Internal Laundry; -Air conditioning; -Built-in wardrobe; Location: -12min walk to Marrickville Train station; - Bus stop across the road Extra Info: -2 weeks Bond; Please contact via inbox or text me to arrange an inspection. NBN Internet/wifi is included in the rent. A large sunney ensuit king single room with own private toilet and shower. 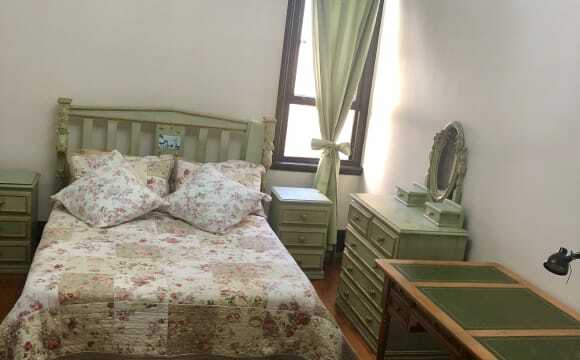 7km to Sydney CBD, Furnished with a single bed (you can bring your own bed), bedside table, wardrobe, desk and chair. All bills are included, I need 2 weeks bond and 1 weak rent payment in front. The house is newly renovated, nice and tidy, walk distance to Sydenham and Tempe station. Bus stop for (422, 348,425) 100 meters away direct to Usyd, UNSW and Sydney CBD via Newtown. This is a quiet, non- party house, house mates are friendly, nice and clean. If you are interested please contact me for inspection. Forgot to add.... Netflix is available on the smart tv. Great neighbours, low maintenance garden, if you're into that. Clean house in a quiet and central area of Marrickville. 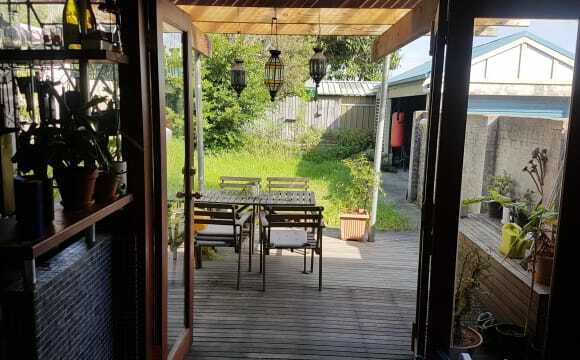 Close to shops, train station and local parks. Room is furnished. Nice leafy backyard :) Very easygoing and friendly household. Large modern townhouse, located in Tempe on a quiet street. The house has air-conditioning, security system, large main bathroom, gallery kitchen and Large living area. Lockable garage with 2 parking spots available. Really good location - Only a few minutes walk to Tempe station, close to Wolli Creek, Marrickville and roughly 15 min train ride to CBD. Two rooms available from the 27th April Looking for 2 new flatmates to move in with me - after someone who is friendly, considerate and easy to get along with. Someone who is tidy and cleans up after themselves, and is willing to do their bit. I don't mind if you keep to yourself but is up for a wine occasionally. It's a pretty quite neighbourhood and isn't a party house. Looking for long term renters and preferably working professionals. The available room is nice and big (3.4 x 3.6 m) and includes a wall-to-ceiling mirror, spacious built in wardrobe, and bookshelf. It's super light and breezy, with high ceilings, and can fit a loft bed. Our house is in a quiet cul-de-sac away from the main street noise (we do get some noise from the trains). There is free on-street parking. We have a huge backyard which is super private and gets lots of sunshine. In summer, we set up a pool, which helps with the Australian heat! Our backyard is very much a garden - we both love plants, so its very green and a great chill out space. Our bathroom has 2 showers (you never know when you might want some variety) AND a bathtub. We have a spare room (4.5 x 4.5 m) which we use as a second lounge room/quiet space/study/guest room. It's a 5-minute walk to Marrickville station and buses on Marrickville Rd. There are several bars, cafes, restaurants, and shops literally just around the corner, as well as a grocery store, doctors, and chemists. All bills are split evenly between the three housemates. Bills: - TPG Unlimited Internet: $20 a month - Electricity: Approx $1 each/day in summer and $2 each /day in winter. We aim to keep our bill as cheap as possible and would like to live with a housemate who is also into conserving electricity. We also share responsibility for buying basics like Who Gives A Crap toilet paper and cleaning products. There is a communal kitchen cabinet and room for each housemate to store their groceries. The tick boxes only give the binary option of male or female housemates but we welcome anyone who is female identifying or non-binary gender. A modern, clean and airy 2 bed apartment on the top floor of a small block with not too many neighbours. The bedrooms are on different levels as well, for added privacy. The room available: * Double sized, with a 3 door built in wardrobe. * Own bathroom (pictured) There is a storage cage in the basement, and linen cupboards in the house as well for anything else you need to store. The furnished pics are real estate photos. The kitchen, laundry and lounge are mostly furnished but there should be room to bring in other furniture/household items you may have. Best of all - the location is amazing. Right opposite Enmore Park, and a few mins walk down to Marrickville Metro. Pubs and cafes galore, and that Gozleme at Addison Rd markets will scream your name on a Sunday morning. 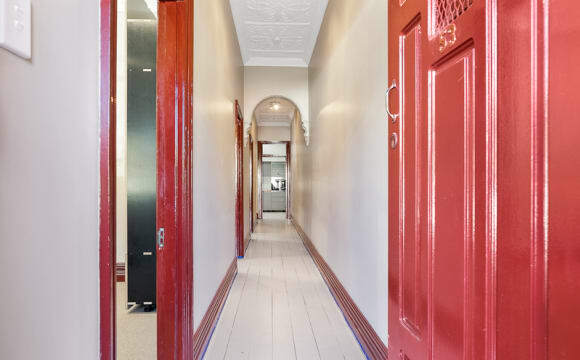 Large 4 bedroom (1 ensuite), 2 bathroom split level warehouse/factory renovation, with open plan living area connected to a large outdoor area upstairs as well as a private courtyard downstairs. Hardwood timber floors throughout the sunny upstairs living area which has a TV, dining table and a massive comfy couch. Fully equipped modern kitchen with a huge oven/stove top, dishwasher and an upstairs bathroom. The master bedroom is carpeted in both connected rooms (bedroom &amp; retreat room) and has a large new ensuite which includes a bathtub. The master room has large in-built wardrobes and also connects to a private courtyard downstairs that is shared with 2 other rooms. Everything is pretty new - we moved in a year and a half ago and the place was recently renovated before we got here. Fully air conditioned / heated throughout. The room is huge. It covers the entire top floor of the house, so it's essentially the size of the footprint of the house. If you're looking for space then this room is for you. I challenge you to find a larger bedroom this close to the CBD. The house is very modern and does a great job at keeping out any noise. It's only a short walk to the train station and very easy to get into the city. The house is located very close to King Street Newtown , where there is great night life and little shops. The house also has secure off street parking. 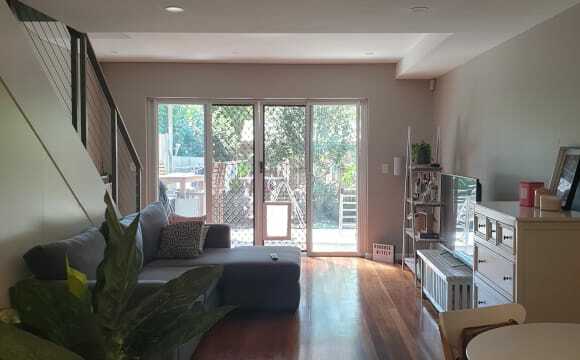 A stunning 3 bed house on border of Enmore and Marrickville, and opposite Enmore Park. Beautiful bathroom and kitchen. House is incredibly spacious. Directly opposite Enmore Park and Pool, 2 mins from Marrickville Metro, and 5 minute walk to Enmore. No off street parking but heaps of on road parking available.